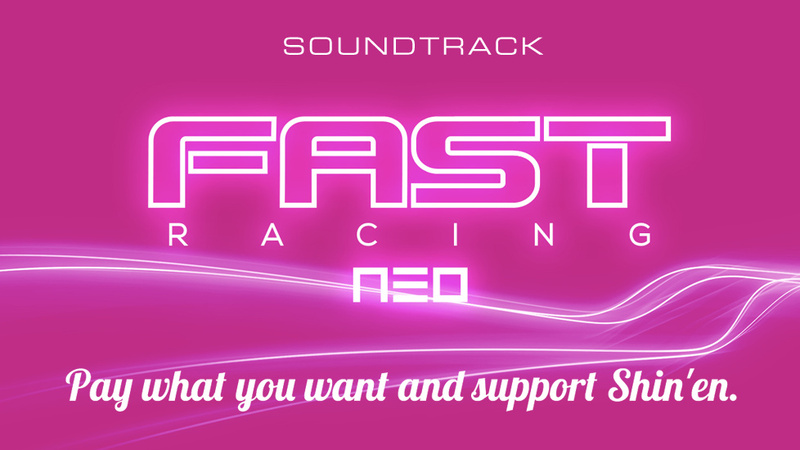 FAST Racing NEO, a standout Wii U eShop release in late 2015, got a little more enticing this week with the release of the NEO Future Pack DLC, with a price of $4.99 / €4.99 / £4.20. The gameplay is naturally a major part of the appeal, but another strength of this game (and various others by Shin'en Multimedia) is the music, which drives you on to increasingly insane speeds and jumps. The good news is that the soundtrack is now available to buy. The studio's Managing Director Manfred Linzner has pointed us to the official website where you can buy the album - it has 26 tracks (approximately 80 minutes of playtime), is DRM-free and can be downloaded as VBR MP3s and/or master-quality FLAC files. It's a pay what you want deal, too, with the idea being that you're directly supporting the developer; the minimum cost is $5, though you can go as far beyond that as you wish. You can check out some 30 second previews of tracks below. Are you tempted to grab this soundtrack? Let us know, but just watch your speed if you decide to listen to it in the car. It's not pay what you want then is it. Start price is the same price as the DLC. Anyway.. Pay what you want always starts from 1$. @AcridSkull It's pay what you want within reason, then. Not for my taste, and given that I've bought the physical FRN in addition to the digital, I don't see the need to offer more support. I'm giving this a pass. Well, the soundtrack is great when you're hurtling round a track at 800kph but I'm not sure I want to pay $5 to listen to it elsewhere. How good would F-Zero themes be remixed in this style?! Never liked the screeching 'guitars' from F-Zero X. Please let there be an F-Zero NX in the pipeline! It's been forever since I've played this, so I'll need to boot it up and refresh myself on what it sounds like before deciding whether I want the soundtrack. I always enjoyed how paying less than one dollar over at the humble bundles would reward you with a sloppy drawing of a poor indie dev working out of a cardboard box. Also extremely sad to read the comments above. I have been making music as a hobby for the past 17 years or so and always put my efforts up for free download. I eventually gave in to pressure from fans to open up shop at Bandcamp where I sell full length albums for 4€. And here I am reading you guys complaint that because you can't pay 1€ for this terrific, professionally composed 27 track album it is not really "pay what you want". Do you realize artist have bills to pay and have to eat? That making music is a incredibly stressful endeavour? And that supporting Shin'en directly like this is a way to tell them "Yes please, keep on making these games!". I am more than happy to pay the asked price to have this wonderful upbeat soundtrack of one of my favourite Wii U games ever made. So please consider your words carefully because behind every product like this game or this soundtrack its hundreds of working hours and effort from individuals like you and me. Probably won't get this, but I got the Neo Future pack, and it is really cool! I just hope Shin'en patches the issue where you have to connect to the e-shop from within the game every time in order to use the dlc (assuming that wasn't on purpose...). @Shiryu THANK YOU! Here I was gonna say the same thing really. I may just purchase this to support the developers. I'd probably wouldn't listen to this in my free time (I'm more interested in music that is more guitar and piano based), but I love the game so much that I think $5 is fine to help out developers of such a great game.